Horse Cake is a chocolate cake shaped like a horse head. I served it at Fuzz’s birthday and it got a lot of good review. Plus it’s cute! The cake is adapted from a recipe on Epicurious and the frosting is from somewhere else. 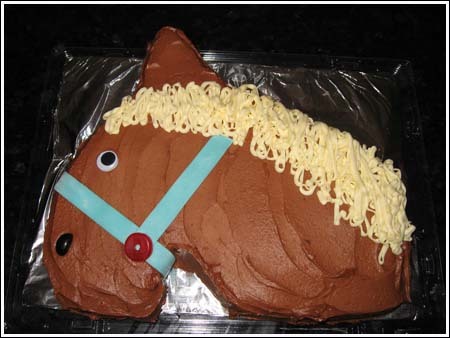 To make a horse cake, follow recipe below, then freeze cake. Carve frozen cake as described here. If you want to skip the scratch cake, you can always make a horse cake with any good chocolate cake mix and your favorite icing. Preheat oven to 350 degrees F. Line a 13x9 inch baking pan with foil leaving a slight overhang; spray foil with cooking spray. Whisk flour and next 4 ingredients in medium bowl and set aside. In a large mixing bowl, using an electric mixer, beat brown sugar and butter until fluffy, about 2 minutes. Add eggs 1 at a time, beating well after each addition. Beat in vanilla. Stir in flour mixture, alternately with buttermilk. Stir in water (or coffee). Let batter cool if it is warm from the coffee, then stir in the chocolate chips. Pour batter into pan and bake until tester inserted into center of cakes comes out clean, about 225-30 minutes or until cake springs back when touched. Set pan on a rack and cool completely. Wrap tightly in foil and freeze until ready to use. Make Frosting. Using the top of a double boiler or the microwave, melt the chocolate and butter together. Stir in the espresso powder, then transfer melted chocolate mixture to the bowl of a stand mixer. In a food processor, process sugar, cocoa, remaining butter and salt until thoroughly mixed. Scrape sugar mixture into the stand mixer bowl with the melted chocolate mixture and beat until smooth. Stir in cream. Place the mixing bowl in refrigerator and chill until very cold. When chilled, mixture will be firm. When ready to use, set the bowl at room temperature until the mixture is not quite so firm. Using a stand mixer with a whisk attachment, beat cold chocolate mixture until fluffy and spreadable. Note: This makes enough frosting to frost two 13x9 inch cakes. It freezes well, so you can freeze half or use all at once. I can't really give proportions because I tend to just throw things in the bowl and beat until the consistency seems right, but the mane was made with softened butter, shortening, confectioners sugar, vanilla and milk. I also did a vegan (dairy free) version with Willow Run spread, shortening, confectioners sugar and soymilk. I emailed this version to Lora and am posting it here. Preheat oven to 350 degrees F (180 degrees C). If you are making a horse cake, line a 13×9 inch pan with non-stick foil. In a large mixing bowl, six the dry ingredients thoroughly. Add liquid ingredients Mix until uniform, then beat with an electric mixer for about a minute. Bake at 350 degrees for approximately 30 minutes for round pans or 40-45 minutes for 13×9 inch. Let cool on a rack. Freeze cake. Carve cake while frozen or partially frozen. Frost cake with a thin layer of frosting while frozen. Let it thawn then add another layer of frosting and decorate. Stir together softened vegan butter, cocoa and 2 cups of the sugar. Add soy milk and vanilla and stir again. Using high speed of electrix mixer (I use the whipping attachment on my stand mixer), beat icing for a minute. Add the rest of the sugar, adding just until you think it’s the right consistency. Beat for a good 3-5 minutes, scraping side of bowl often, until light and fluffy. Ice the cake. May I get your vegan recipe for this cake? My daughter has allergies to milk and eggs. For her second birthday I would love to make this cake. The cake looks fabulous! I have a daughter with a dairy allergy, could you forward me the vegan version. I would love to make a cake that tastes good for others attending her party. Wow!! I can’t believe you made that from scratch! You do have an artists touch =) What was the texture of the cake like? Daniela, I emailed you the recipe. Let me know if you did not receive it. Alison, I don’t know about the kids, but the parents sure did like it ;). The kids just wanted to eat it. Actually, they did seem to really like it. I was worried it would be too chocolate-packed for them, but they ate it all. Steph, that’s what I love about Family Fun. All the cakes look complicated, but are super simple. Tracy, I used my decorating tubes for the mane. Carole, I am really not talented at all. The person who thought up the cake shape is the brilliant one. Even an all thumbs decorator can make this cake. Oh, Fuzz is always queen for a day — all day everyday. Sandra, just make it. She’ll love it. The cake looks great!! Too bad my daughter that loves horses is going to be 18 on her next birthday. Aw….I might just make it anyway. She’ll probably get a kick out of it!! The cakeis beautiful. As I said before “you are one talented lady” Sounds like all the kids had a wonderful time and that Fuzz was Queen for the day. The cake sounds wonderful. I may just make it without making it into a horse. Great cake, Anna! The mane looks especially delicious. Hope Fuzz had a great birthday. Dutch process cocoa is neutral (alkalized), which means it doesn’t have enough acid to react with baking soda. However, if the recipe has another very acidic ingredient, a leavening reaction will occur. In this case, the other acidic ingredient is the large amount of buttermilk. What a super-looking cake. Quick question about the recipe, thouogh: I thought that Dutch-process cocoa was for recipes w/ only baking powder, or when baking powder quantity is greater than baking soda…am I confused? Doesn’t it make a difference in leavening/rise? Great looking cake! It looks much harder than the instructions appear. : ) Happy Birthday! Ohhh, I need to make a cake for my neighbors daughter – she has lactose intolerance and a vegan cake sounds like something she should be able to eat.